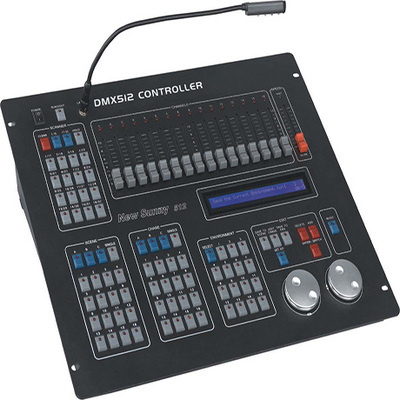 DMX512/1990standard, 512 DMX channels,output with opticalisolated. Up to 62 intelligentFixtures may be connected with a maximum of 36channels each. Uses can allocateDMX channel to each intelligent Fixturedynamically. 16-bit X/Y controlfor absolutely precise movement. Up to 80 SHAPEgenerators. SHAPE track control is provided tocontrol such effects as circles,lines and shapes like 8,etc. 62 Chases, up to 100Steps each. Trigger mode selectable: Musicsynchronously, Auto, Manual speed. 6 Chases, 62 Scenesoperated at the same time. At most 62intelligent Fixtures can be selectedsimultaneously. 31 MACRO, runningcombination of different manual, scene and chasecan be recorded to the MACRO.